Born Edinburgh, Scotland of Irish parents – said to have first come to Ireland in his youth as a member of the British Army – married in 1889 – active in The Socialist movement in Edinburgh in the early 1890s – came to Ireland in 1896 and founded the Irish Socialist Republican Party – lectured on socialism in Britain and U.S., 1902 – emigrated to U.S. in 1903 – member of Socialist Labour Party (U.S.) and the Industrial Workers of the World – founded the Irish Socialist Federation in New York, 1907 – returned to Ireland in 1910 as organiser for The Socialist Party of Ireland – Belfast organiser of the Irish Transport and General Workers Union, 1910 – acting Gen. Sec. of I.T.G.W.U. and Commandant of the Irish Citizen Army, 1914 – Commandant General of Dublin Division of the Army of the Republic, 1916 – executed following the 1916 Uprising. We only want the earth! 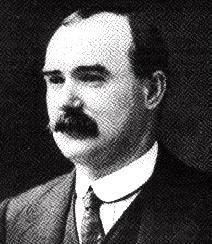 Einde O’Callaghan (Administrator, James Connolly Internet Archive).